on the periphary, Who knows the shadows. He knows every person’s destiny, and so He is associated with magic, divination and spirit-work. In some myths He was abandoned as a baby by His mother, thus making Anubis the protector of orphans, the homeless, the poor, and all who are downtrodden. 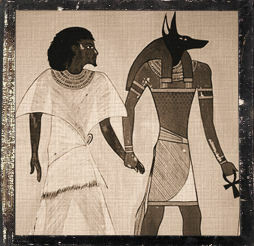 Here’s a great Anubis website! — has info, epithets, etc.